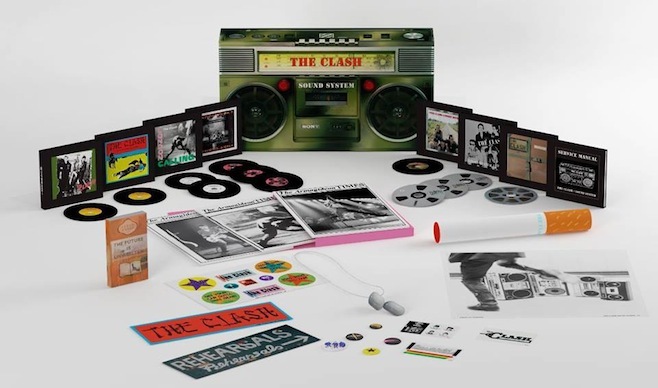 Well, here’s what I want for Christmas: The Clash have announced plans to reissue their entire back catalog in a new box set shaped like — wait for it — a Boombox. Due out September 9th, Sound System collects the band’s five studio albums — 1977′s The Clash, 1978′s Give ‘Em Enough Rope, 1979′s London Calling, 1980′s Sandinista!, and 1982′s Combat Rock — yes, even they’ve disowned Cut the Crap (!) — along with three discs of singles, rarities, demos, and B-sides. There’s also a DVD featuring all of the band’s videos and “unseen footage by Julien Temple and Don Letts”, reprints, a new issue of the band’s Armagideon Time fanzine, an exclusive poster, dog tags, stickers, badges, and more. It will all be housed inside said Boombox, which was designed by bassist Paul Simonon. Guitarist Mick Jones calls it the “best box set ever,” and it’s hard to disagree. There’s so much there that you wouldn’t have heard before. It was like discovering stuff, because the advances in mastering are so immense since the last time [the Clash catalogue] was remastered in the 90s… We had to bake the tapes beforehand– the oxide on them is where the music is, so if you don’t put them in the oven and bake them, that all falls off, because they’re so old. The band has also announced plans for yet another greatest hits album, The Clash Hits Back, which will also be released on September 9th. Its tracklist is inspired by the band’s setlist for a July 19, 1982 performance at Brixton Fair Deal.